The All Saints' Church that stands today is at least the third one on this site. 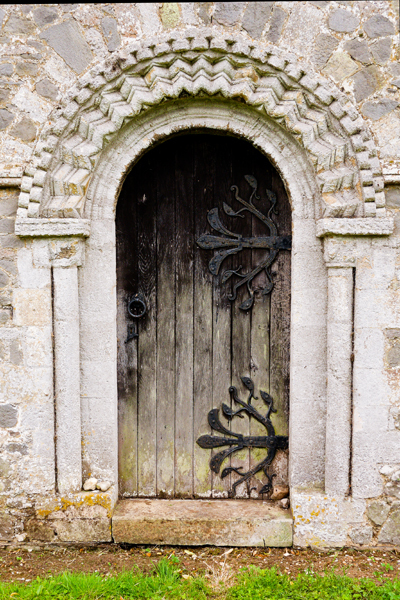 The first we have evidence for was a Norman Church of which we only have two doorways. The second was an early 14th century building, for which we have a careful drawing from the 1820's. The drawing shows it in reasonably good condition, but perhaps in the next 35 years it all went downhill. All Saints Church, Roydon, Robert Ladbrooke 1800's. In 1856 all except the tower was pulled down to make way for a new building, at the behest of Lady Mary Howard (widow of Fulke Greville Howard, the last MP for Castle Rising before the Great Reform Act of 1832). She had paid for Castle Rising Church to be restored in 1847-49 and North Wootton Church to be rebuilt in 1850-53, both by Anthony Salvin. He was busy working on Windsor Castle and Alnwick Castle by 1856 and suffered a stroke in 1857, so a new architect was needed for Roydon. The man she chose was the 32 year old architect George Edmund Street (1824-81), who was already making a name for himself building or restoring Churches in Oxfordshire and beyond. He and his friends pioneered the "High Victorian Gothic" revival style, often with red and brown stries, cheekily labelled "the streaky bacon style". Apart from nearly 200 churches and cathedrals, G E Street's most famous building was the Royal Courts of Justice in London. After some legal training, he first trained as an architect in Winchester in 1841, before moving to London where he worked for Giles Gilbert Scott. Another trainee there was G F Bodley, who later worked on Grimston Church. After some time working as Architect for Oxford Diocese, G E Street established an office in London in 1856. He had just taken on William Morris, the noted designer, who had graduated at Cambridge that year. And in that year he was engaged to rebuild Roydon Church. Later in his career he became Professor of Architecture to the Royal Acedemy and President of the Royal Institute of British Architects. Busy with the Royal Courts in 1881, he collapsed and died of overwork and was buried in Westminster Abbey. 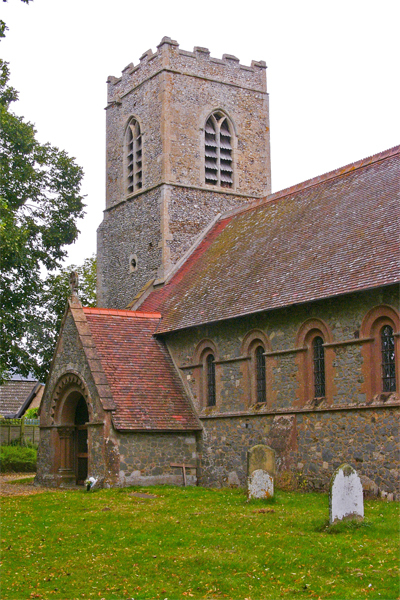 Although Street was an acknowledged expert on 14th century architecture, represented by the existing Church at Roydon, it was decided that the two fine doorways surviving from the 1100's Church should revert to the Norman style, bringing about the creation of one of the fairly few neo-Romanesque Churches of the 19th century in this country. Perhaps this was the idea of Lady Howard, or her cousin Walter Bagot who was Rector of Castle Rising and Roydon at the time, based on a love of Castle Rising's Norman Church. The Church was solidly rebuilt on the same foundations as before, but the colour changes at ground level. The stone below ground level is the same cream colour as the Norman doorways. The new walls were built of silver grey carr stone, without the usual iron stain. Some pink coloured carr stone was added for contrast around some of the windows and doors. The narrow round-topped nave wndows, the East windows and the chancel arch are the main features in Norman style, with a new font and furnishings designed to match. Outside, the tower remains almost unaltered since the beginning of the 14th century, as can be judged by the "Y" tracery of the belfry windows. Only the West window was renewed during the Victorian restoration. The North doorway facing Church Lane and the South doorway inside the porch are both original Norman, but differ slightly in their decorative designs. The North doorway has single shafts and two orders of chevrons, with a hood mould with billet decoration. The South doorway needed several stones replacing, including its shafts, but its volute capitals are original as are the abaci above which have chevrons along the edge. Again it has chevron decoration to the arch and reverse chevrons on the hood mould. Both doorways have fine Victorian doors with flamboyant ironwork on them. Even the keyholes are decorated by fine ironwork. We don't know whether these were designed by George Street or William Morris perhaps. The East end is made grandiose with three separate windows under arches with circular shafts between them. 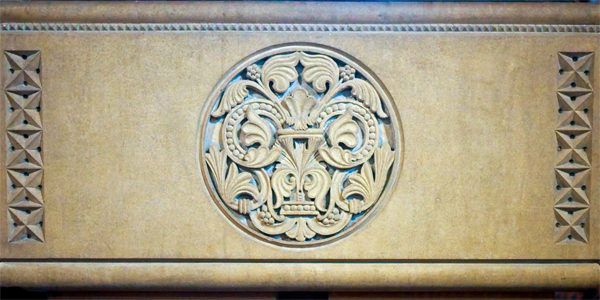 Their hood mould is embellished with two lion heads as well as a floral design. Above is a round window, much bigger than the one on the previous building, according to the Ladbroke drawing. Inside the Church, the whole interior is faced with a soft pink hue, which is set off by beautifully polished woodwork with brass fittings. The roof is well constructed with trussed rafters and tie beams with king posts. 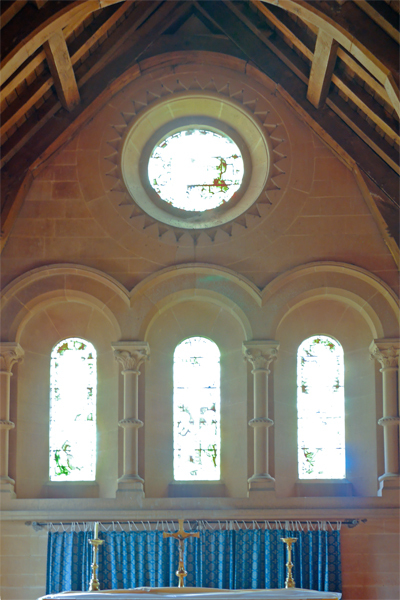 The Victorian windows keep the semi-circular arch in their design and are widely splayed on the inside, a Norman feature to get maximum light from minimum glass. Notice the different number on each side, so that each part of the nave is lit from one side or the other. 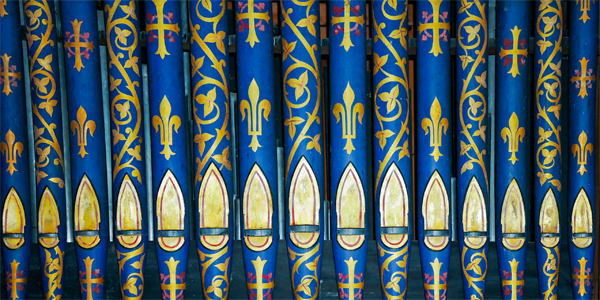 The chancel was designed so that a choir should lead the singing, which was the fashionable idea at the time, so a special organ recess was built on the north side of the chancel and a beautiful organ to fit it was installed shortly after the rest of the rebuilding in 1863, by J W Walker of London. It has nice polished brass fittings including its own candlesticks. Behind the organ there are fine vestry cupboards for choir robes with great decorative ironwork hinges to the oak doors. The chancel arch is a fine example of neo-Norman design, and of course its intricate carvings are in far better condition than you would expect of a real Norman arch. The arch terminates in lavish Victorian decoration and does not come to the ground on either side, so that the congregation may not feel cut off from the chancel with its higher floor level. There is also a neo- Norman sedilia and piscina which must have been quite pointless this long after the Reformation but attempted to giv ethe chancel a well furnished look. The font has legs in Norman style, but the large square bowl and its heavy lid, heavily decorated with ironwork are rather more obviously Victorian. In addition to the two oak reading desks and the pulpit from the 1857 restortion, there is a modern litany desk in memory of Frederick Brown, the organ blower. The chair was given in memory of Honora Susan Elwes who died in 1959. The West window, depicting St Peter & St John, is glazed in memory of "Edward Pinder, sometime curate of this Church" who died in 1859. He had pastored the people of Roydon through the time of the rebuilding. He lived at the (old) Parsonage House in Church Lane. An iron ladder leads to the first stage of the tower. Higher up is the ancient bell, inscribed "Tobye Norris cast me in 1869 T Drinkmilke I Blomfeild" (the mis - spelling of Blomfield due to being inscribed back to front on the mould). Toby Norris III had a foundry at Stamford. The bell was rehung in 1994 after several decades when it hadn't been safe to ring. There are two war memorials on the North wall. The first is a painted panel of teak with a fine angel at the top, and below the list we see the crucifixion with two soldiers who also suffered and died for us. 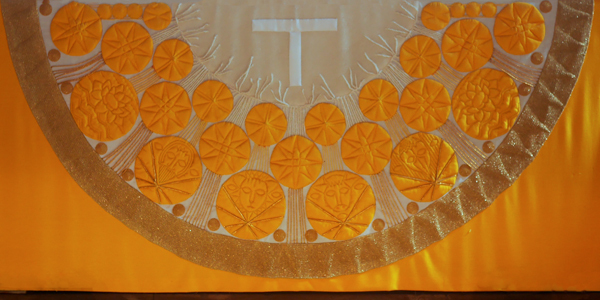 The dedication of All Saints is reflected in the altar frontal, with it's many different sized circles reminding us that the Saints are not just the famous ones but all God's people. (The same circles idea is repeated on the Church gates on Church Lane). Look out for the symbols of Matthew, Mark, Luke and John amongst them and also a lily, as the frontal was given in memory of Lily Lake, organist here fro 40 years. It was made by Cynthia Russell of Dersingham. The East windows by Clayton & Bell were given in memory of Ann Gay who died in 1876, when it was possible to produce a higher quality of colouring than the West window. The round window features the Nativity. The three panels below show the Resurrection of Jesus, his Crucifixion and Ascension. 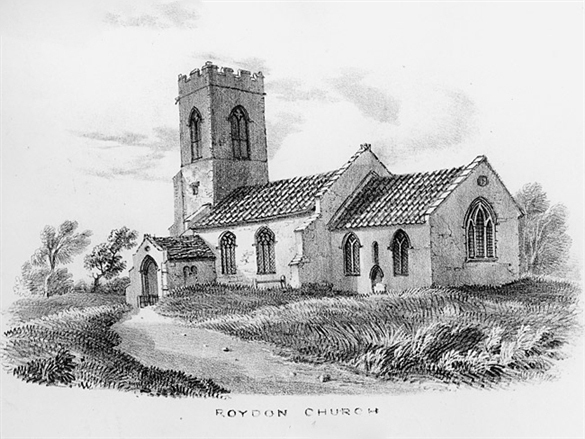 The population of Roydon was very small, even after the coming of the railway in the mid 1800's. 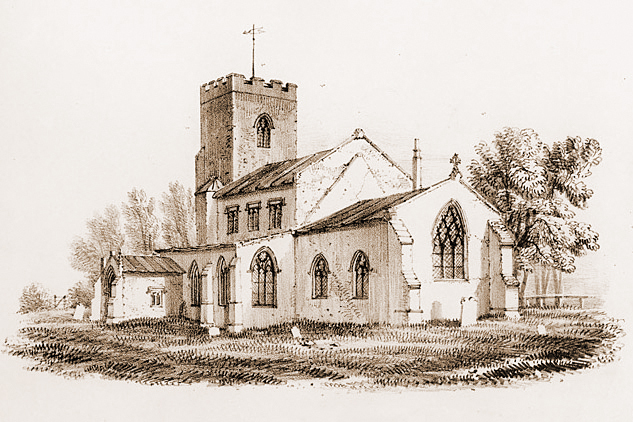 Comparing Roydon with Grimston and Congham, in the decade from 1756-66 there were only 8 weddings at Roydon, while there were 22 at Congham and 42 at Grimston. The list of Rectors begins with Thomas de Holm (undated) whose successor was appointed in 1308. From 1665 to 1964 Rectors of Roydon were also Rectors of Castle Rising and after that Roydon was combined with Grimston and Congham. In 2015 Roydon was combined into the GGM Benefice, (Gayton, Grimston and Massingham and District Team Ministry. The Church register before 1721 is missing and the 1721 - 1812 register got spoilt by damp. This may indicate that the old Church was in a poor state of repair prior to 1856. The Elizabethan Communion Cup, dated around 1580, is inscribed "The Towenshype of Ryden". It is still in use today, a tangible reminder that the Church has kept going through thick and thin. Through its two or more rebuilds, the Church must have has many ups and downs, but at its heart it remains a place of prayer, teaching and the worship and praise of God.